Newport News is one of the cities that makes up the metropolitan region in Southeastern Virginia and the starting place for our trip. 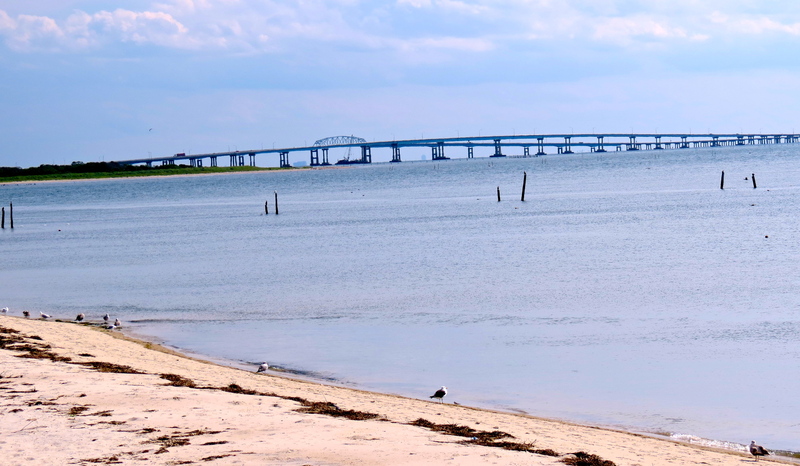 We’re skipping the popular vacation spots in the area, such as Williamsburg, Jamestown, and the adventure parks, and instead opting to visit the lesser known regions further north along the Chesapeake Bay. in past journeys and have not been disappointed. Small towns retain the flavor of a bygone era, as visitors experience an authentic working community. Most of the towns have historic main street districts with parks and libraries within easy walking distance of the shopping districts. You might find a gazebo, an old-time movie theater or general store along their business thoroughfares. Restaurants and coffee shops have their own unique personalities, offering dishes with a local flavor. Residents own many of the smaller shops, where you can find one-of-kind objects. Rehabbed buildings and warehouses sometimes house art and craft galleries, and often communities establish an art center near the center of town. In the smaller towns across America, Main Street is surprisingly similar, with even the name “Main Street” being the same in many communities. Other common names for streets are Second, Third and so on. Often the names of trees serve as street names, such as Oak, Pine or Maple. The street itself serves as an anchor to the sidewalk and then the buildings, which line up next to each other and on either side of the street. Usually the smaller store fronts are not as wide as they are deep. Sometimes you can find an old railroad station, the tracks and engines now gone, and the building converted into a museum, shop or visitor center. Well, I’d better show you how our town lies. Up here-is Main Street. Way back there is the railway station; tracks go that way. Polish Town’s across the tracks, and some Canuck families. Over there is the Congregational Church; across the street’s the Presbyterian. Methodist and Unitarian are over there. Baptist is down in the holla’ by the river. Catholic Church is over beyond the tracks. Here’s the Town Hall and Post Office combined; jail’s in the basement. Along here’s a row of stores. Hitching posts and horse blocks in front of them. First automobile’s going to come along in about five years-belonged to Banker Cartwright, our richest citizen . . . lives in the big white house up on the hill. Here’s the grocery store and here’s Mr. Morgan’s drugstore. For those of us who remember the carefree time it recreates, Main Street will bring back happy memories. For younger visitors, it is an adventure in turning back the calendar to the days of their grandfather’s youth. In literature authors have written about small-town America and often criticizing their social and political mores. Sinclair Lewis published a satirical novel, Main Street, in 1921, dismantling the myth of small-town wholesomeness while mocking traditional values. Main Street was not an inclusive space for African-Americans during the Jim Crow era. The website, The Myths of Main Street, reminded me of the bleak and oppressive atmosphere that anyone of color endured during that time. For now, my sister Jean and I are just tourists winding our way through these southern towns. Reading about the history of main street has certainly given me material to think about as we travel. Main streets have made somewhat of a comeback since the 1960s when malls began to take over the commercial enterprise of these towns, while main streets deteriorated and, sometimes, disappeared. Hopefully, these historic downtowns will win out against the larger corporations, which engulf so many of our small businesses. Locally run businesses ensure that community members make the decisions that will influence their lives in their towns. 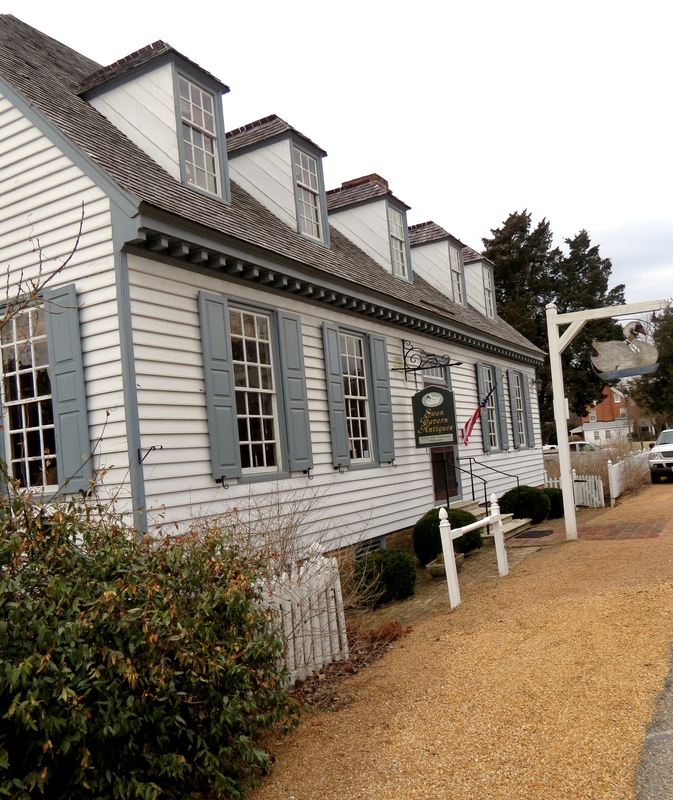 Our first stop on this road trip was the hamlet of Yorktown, famous for the battle that brought the American Revolutionary War to end when the British commander, Cornwallis, surrendered to George Washington on October 19, 1781. The Yorktown Battlefield Visitor Center is just off of Highway 17. Visitors can drive through the battlefields, watch a film and tour historic houses. We could have spent an entire day there. The revolutionary war battles took a toll on Yorktown, leaving all but 70 buildings standing. In 1814 a fire swept through Main Street and the waterfront area. Union forces added to the destruction during the Civil War. Today the population stands at about 200. We wandered down Main Street and into an 18th century building, Swan Tavern Antiques, where ten rooms were decorated with furniture and accessories from that era. Churches have an important place in small towns, and no better example the Grace Church, which has been used by worshipers for over 300 years. 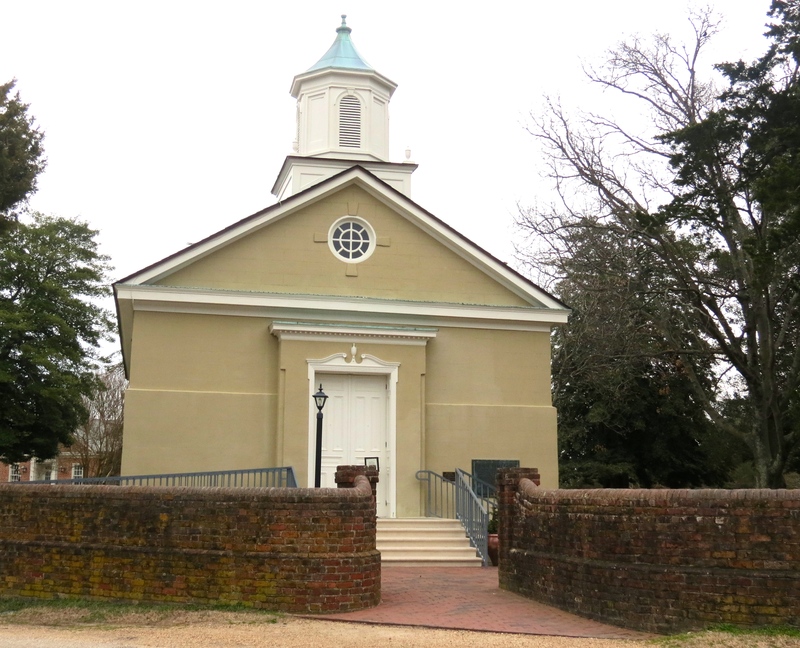 Originally an Anglican church, the building survived the Revolutionary War, Civil War and that 1814 fire. After the walls were rebuilt in 1848, the congregation renamed the church. We strolled along the Waterfront Landing, which followed the York River. In late April, pirate reenactors, representing seafaring life in the late 17th and 18th centuries, invade Yorktown and set up an encampment. Might be worth returning to sing with the pirates. We returned to Route 17, crossing over the George P. Coleman Memorial Bridge toward Gloucester County, which is important for its farm and fishing industries. The county is nicknamed the “Daffodil Capital of the World” and holds a festival in April with parades and shows. Gloucester has a visitor center on Main Street and has a self-guided tour of important buildings. From Gloucester, we drove north on John Clayton Memorial Highway into Mathews County. Intersected by three tidal rivers, the county has over 200 miles of shoreline. 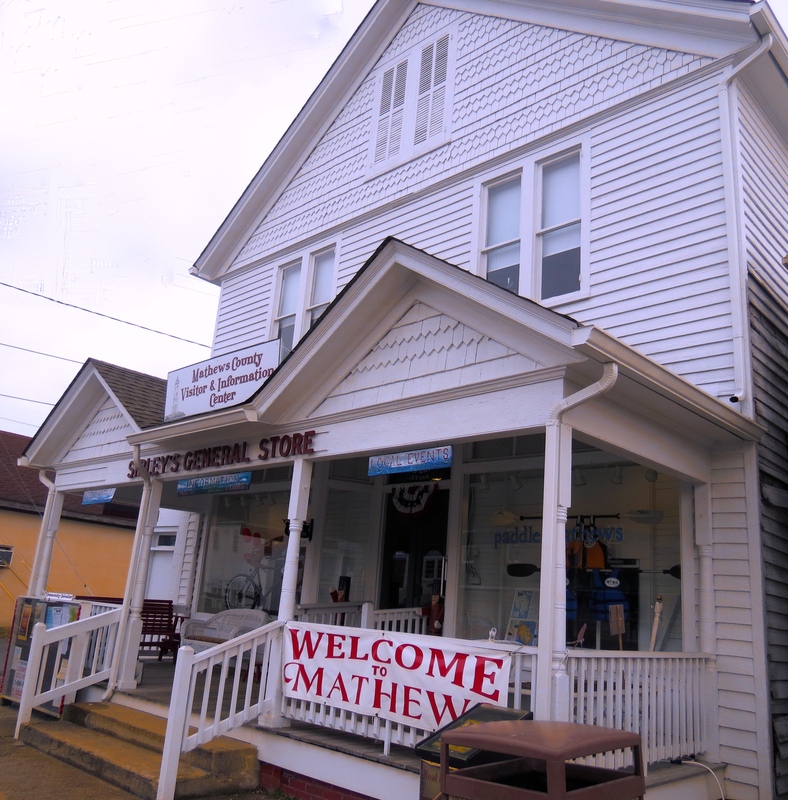 Route 14 goes through downtown Mathews, where we found the Mathews County Visitor and Information Center, once Sibley’s General Store, and now selling guide books, maps, and local crafts. 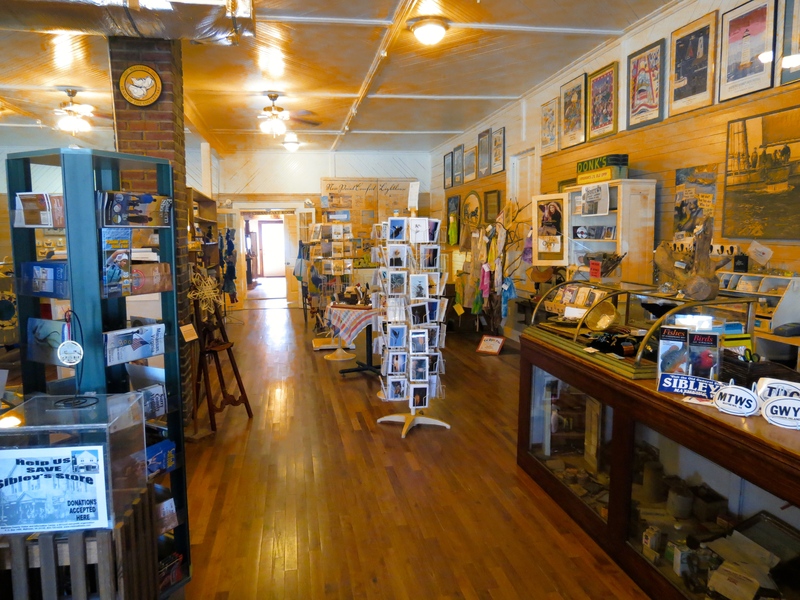 A small museum in the back of the store holds historical memorabilia of the county. 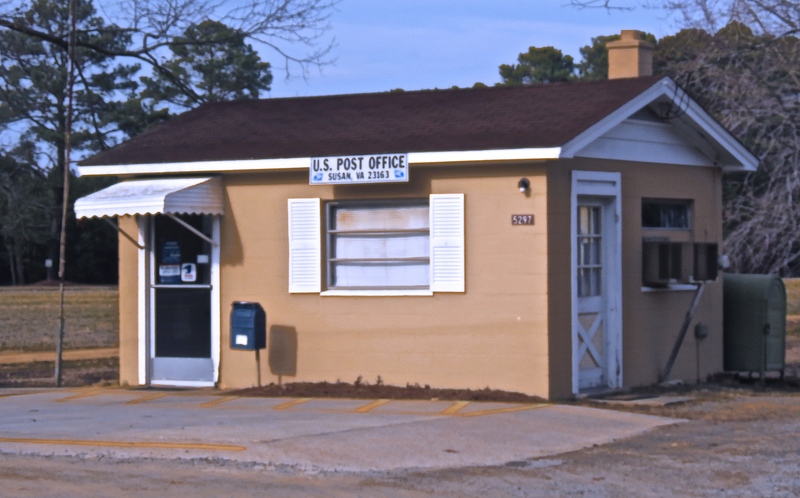 Heading south from Mathews on New Point Comfort Road, we continued down the peninsula, missing our turnoff but finding this example of one of the small post offices that dot the landscape of the area. We missed the turn because we were not expecting that Turpine Lane was a dirt road, which we now observed were indicated with blue signs and not the usual green street signs. I selected the Inn at Tabbs Creek as our accommodations for the night because of their ecological sensitivity, excellent breakfast choices and amenities, including bicycles and kayaks. Their description of their freshly brewed organic coffee, eggs and vegetables had me looking forward to breakfast there for days ahead of time. The inn stood at the end of a row of tall cedars that flanked the driveway. After settling into our cozy room, we strolled around the main house, investigating the outbuildings and enjoying the views of the bay. We returned to Mathews for dinner at Southwind Pizza, which came highly recommend by the locals and lived up to its claim, “casual dining at its best.” Their squash soup was the best we’ve ever tasted. Jean’s scallops were excellent, and I thoroughly enjoyed the Mediterranean platter. With just a little daylight left we drove down to New Point Comfort Lighthouse, the third oldest on the bay and commissioned by Thomas Jefferson in 1804. 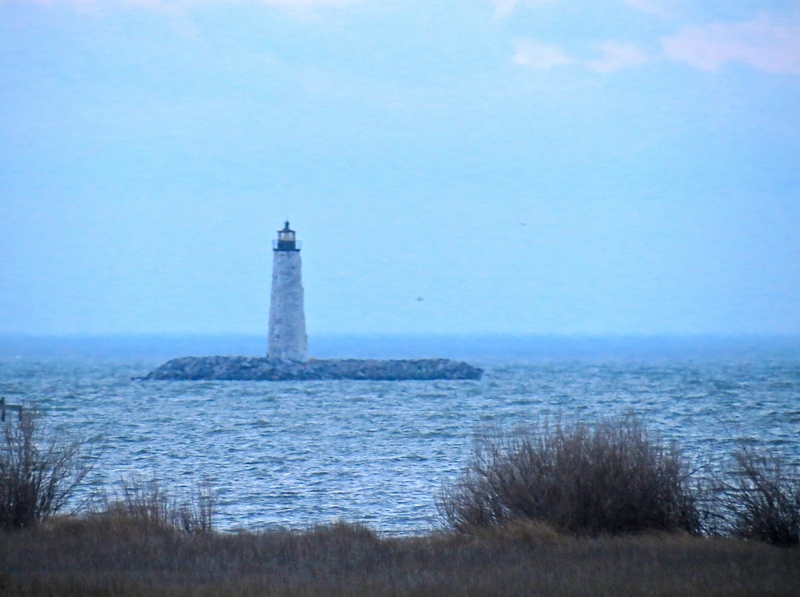 A hurricane in the 1930s separated the lighthouse from the mainland. Even from a walkway, which was the only structure in this remote location, the lighthouse was still a good distance away. I took the photograph below with the maximum setting on my zoom lens. Back at the inn, the wind howled throughout the night, and we woke up to a 20 degree temperature drop. Bundling up with hats and scarves, we rushed over to the main house for a delicious breakfast: french toast with strawberries casserole and an egg and cheese strata, biscuit, fresh fruit and French-pressed coffee. After packing up, we drove north to Gwynn’s Island, a small triangle of land on the mouth of the Pianktank River. A marina sat on the other side of the bridge, and we followed the road that ran along the bay, offering wide views of the water. The island was quiet as the summer tourist season was still months away and most of the cottages were empty. We stopped at a beach near the end of the road to take a look around. An abandoned shack faced the bay, and we wondered about the story of this little house. Towering pines in the distance swayed in the wind. As I was researching the history of the island, I found a newspaper article that recounted a story about an African-American woman’s experience of moving to this community in 2009. She did not stay long because of harassment that both she and her children experienced in their short time there. The Gwynn Island Museum, housed in the former school building, holds the history of the island, including pictures of African-American families who worked on the island in the fishing industries. Between 1910-1920 all the families left the island, most likely because they feared for their safety. Difficult to believe that only several years ago, that a similar history would repeat itself in the land of the free. The Northern Neck . . .
From Mathews, we headed north along Route 3, crossing over the Rappahannock River. Virginia’s rivers, such as the Rappahannock, used to freeze over entirely during winters of the late 1800s and early 1900s. The Chesapeake Bay would also have ice floes that were a hazard to navigation. If global warming has been happening slowly, generations are gone now to tell us what the weather was like a hundred years ago. This area is well-known for its water views of the Chesapeake Bay, creeks and rivers. Making a left turn at the town of White Stone, we drove only a few miles before arriving in Irvington. A thriving town at the turn of the 20th Century, Irvington served as a port for steamboats. About 600 steamboats worked the waters along the Chesapeake Bay. In the summer of 1917, a fire destroyed many of the buildings, and the Steamboat Era came to an end. The Steamboat Museum houses memories and memorabilia from that time, but it was closed when we arrived. Named for a Scottish town in East Ayrshire, Kilmarnock was once called “The Crossroads.” Towns often sprung up at intersections of transportation routes and grew according to the level of commerce that supported the community. Before exploring the downtown, we stepped into then Kilmarnock Antique Gallery holding 22,000 square feet of antiques and deserving of its honor: voted number one by Pleasant Living Magazine. Most of the structures on Main Street were brick, and housed a variety of boutiques, galleries and restaurants. The story of small towns in America is still unfolding as townsfolk adapt to changes, both economic and social. Community members continue to work together to preserve the architecture and ambiance of a former time while struggling with the prejudices that, even to this day, rain on the American parade down Main Street. I’ve made this trip often, so I thought that it might be time to journal the drive. We’ve changed our route over the years, as new highways now bypass some of the little towns. The new routes take less time with the elimination of traffic lights but have lost the chance to view the environs of these towns. Along the way, many interesting places beckon us to explore rather than stay on course for our destination. We start our journey on my least-favorite highway, the congested Route 95, which is a direct route, if nothing else. At Delaware, the highway splits and Route 495 provides a pass around Wilmington. For a few miles, we see expansive views of the Delaware River, bridges, factories, ship yards, refineries and a big hill where trucks haul trash to the top. With major construction on-going, we navigate through the cattle shoots, jostling for a place on the highway with 18-wheelers. Opened in 1995, this bridge is one of the first of its kind in the area. A concrete and steel cable-stayed bridge, it spans the Delaware Canal, which connects the Chesapeake Bay to the Delaware River. Just off the bridge, fields of corn alternate with suburban sprawl, box-like newer construction–single family and apartment complexes. Scrub forests and mixed pine and deciduous woods fill much of the landscape. 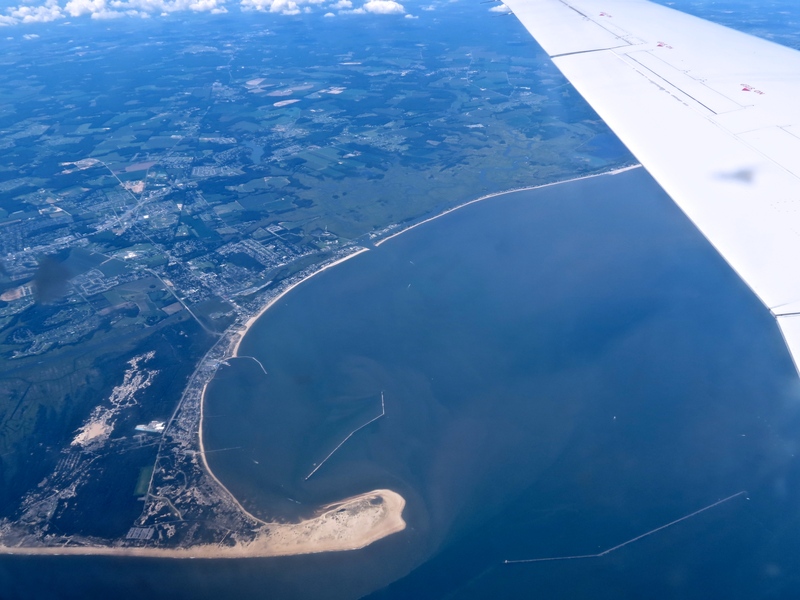 The Chesapeake Peninsula is coastal plain, which is a sandy, flat area, and the view from the car are fields of crops and outcroppings of forests in unpopulated areas. Small and large stands selling fruits and vegetables regularly appear along the highways. Along Route 13, shopping districts and homes have sprawled over some the farmlands in the last twenty-five years. Ocean City is a popular seaside resort for folks who live in the Mid-Atlantic region. Even though I have lived just three hours from this town, this will be my first visit. Our family vacationed at the Jersey Shore, specifically, Cape May. On this trip I thought it was time to stop at Ocean City, lured by the chance to walk along the lively 3-mile long boardwalk. After sitting in the car, will be good to get out and smell the sea air. The Ocean City website listed a variety of events in the city: fireworks, concerts, movies and laser light shows. A short drive from Ocean City, we stopped for lunch in the historic town of Berlin. The residents have restored the buildings along the main streets, where eclectic gift and antique stores feature displays in their windows. The tree-lined streets, Victorian lanterns and planters filled with flowers made this town an inviting stay. Several restaurants, such as the Drummer’s Cafe, Rayne’s Reef Luncheonette and SiCuli Rustic Italian offered a variety of choices for lunch. We ate at The Globe, once the neighborhood movie theatre and enjoyed a tasty lunch while watching an old-time flick. 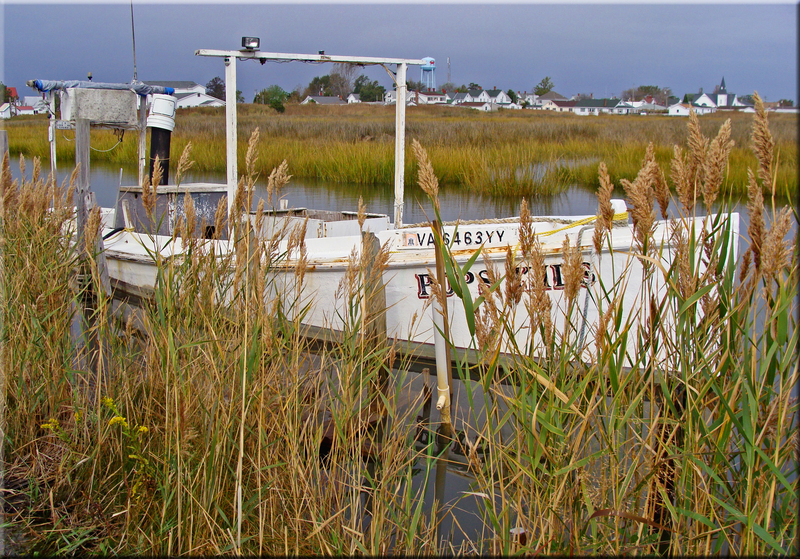 Blog post, Tangier–Virginia’s Island Lost in Time, describes our visit to Tangier Island in 2011. Parksley was a planned community as a result of the railroad constructions on the Eastern Shore and is representative of the small town atmosphere of that era. The commercial district in the center of town has a number of shops and restaurants. Victorian houses stand along the shaded streets. Founded in 1988, the Eastern Shore Railroad Museum is housed in a restored train station. Around the station, railway cars, such as the Fredericksburg and Richmond Post Office Car and the Wabash Caboose rest on tracks. Onancock comes from the Indian word “auwannaku” meaning foggy place, but it was a bright sunny day when we arrived. This town offers much to see with self-guiding walking tours past historic homes and lovely gardens and places to rent boats and kayaks. A ferry operates out of Onancock Creek to Tangier Island. For over a century, the Hopkins and Brothers operated a mercantile store, as Onancock had been a busy center for trade. Renovated and moved, the interior of the building still maintains the look of a country store. 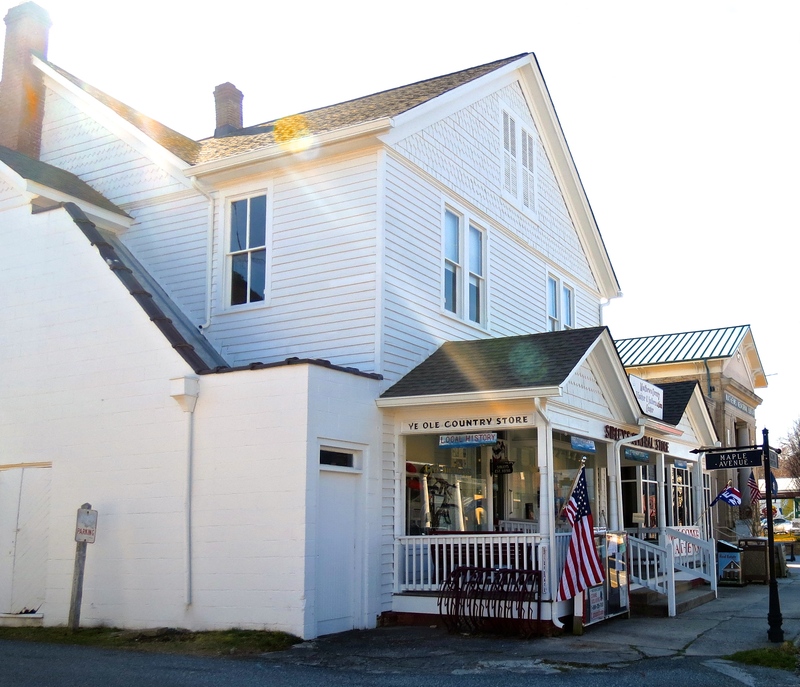 A number of old-fashioned general stores still remain in operation along our route, which inspired this post on the political and social aspects of losing the general store in the American small town. 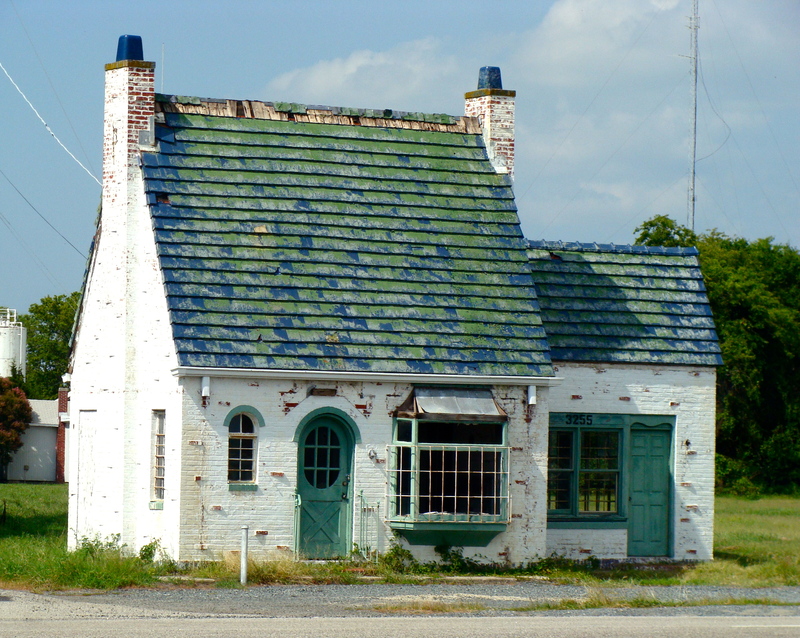 Turning off 168, about twenty miles from the Chesapeake Bay Bridge, we found this attractive little gas station. Read more about this station and others like it at: Nostalgic Memorabilia: Filling Stations of the 1920s. We explored the bay-side town of Cape Charles. 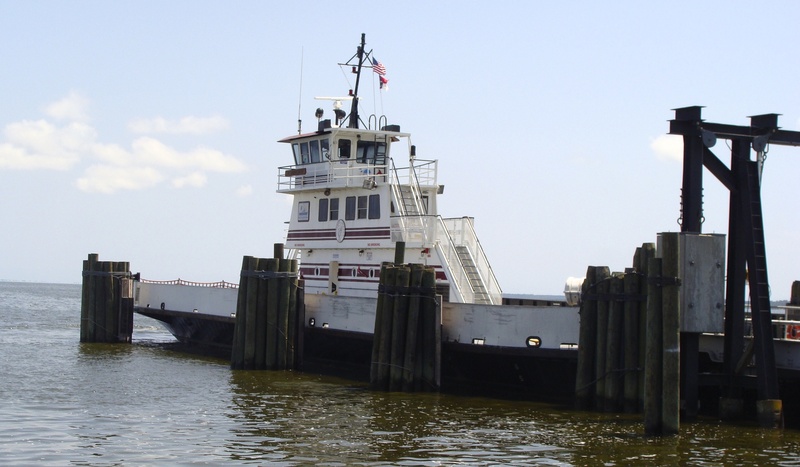 For many years the town had been the terminal of the Little Creek Cape Charles Ferry, which provided car ferry service to Norfolk and Hampton. Now an expansive beach runs the length of the village. Many of the homes date back to the early 1900s, and the town center has a distinctly small town main street. Across the mouth of the Chesapeake Bay the bridge meets the Atlantic Ocean and opening of the Chesapeake Bay. 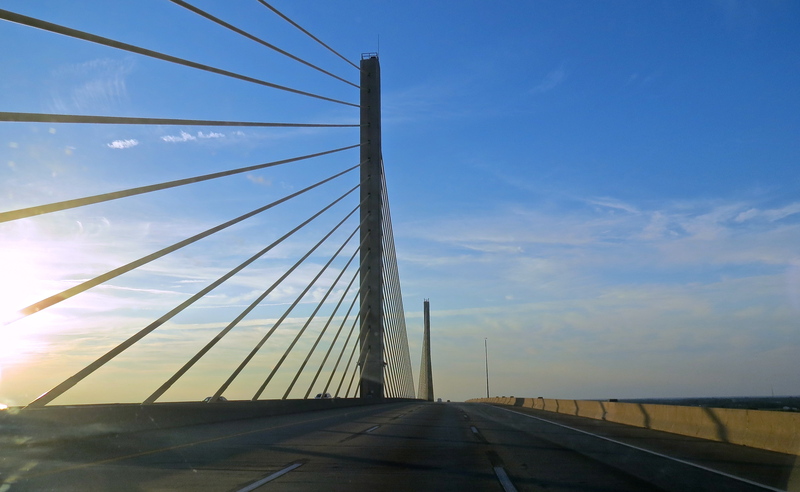 About 17 miles long, the bridge connects Cape Charles with Norfolk. The Bridge-Tunnel, opened in 1964 and considered the largest bridge-tunnel complex in the world, consists of low trestle bridges, two suspension bridges and two tunnels, each a mile long under the shipping channels. 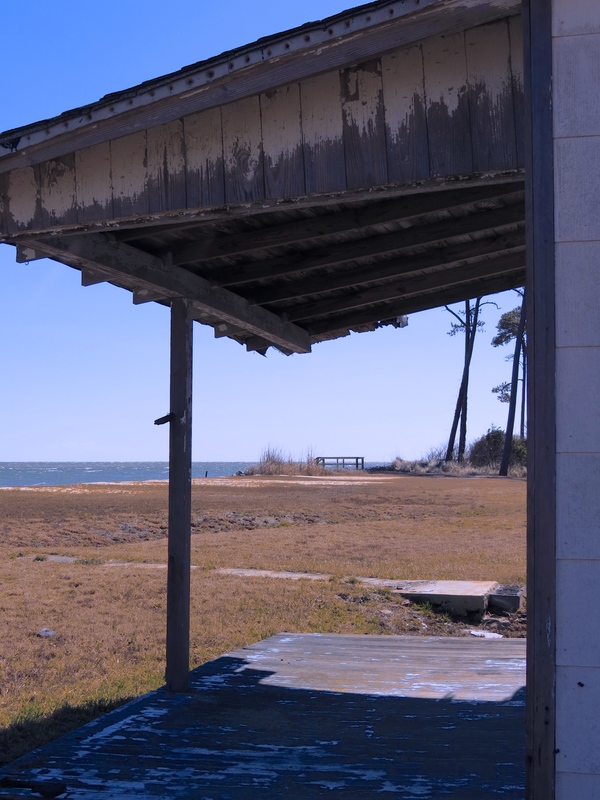 Just off of Route 168 and situated on the Currituck Sound, the town is the landing for the Knotts Island Ferry, which offers a free shuttle to Knotts Island. 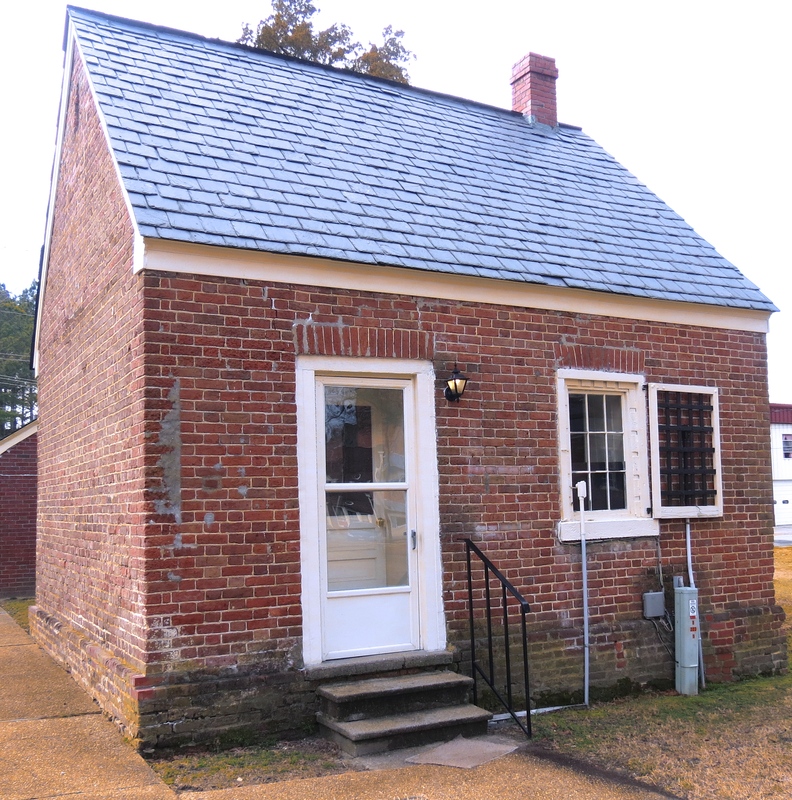 The town has a few brick buildings including the Courthouse and Jail house, dating back to 1820. 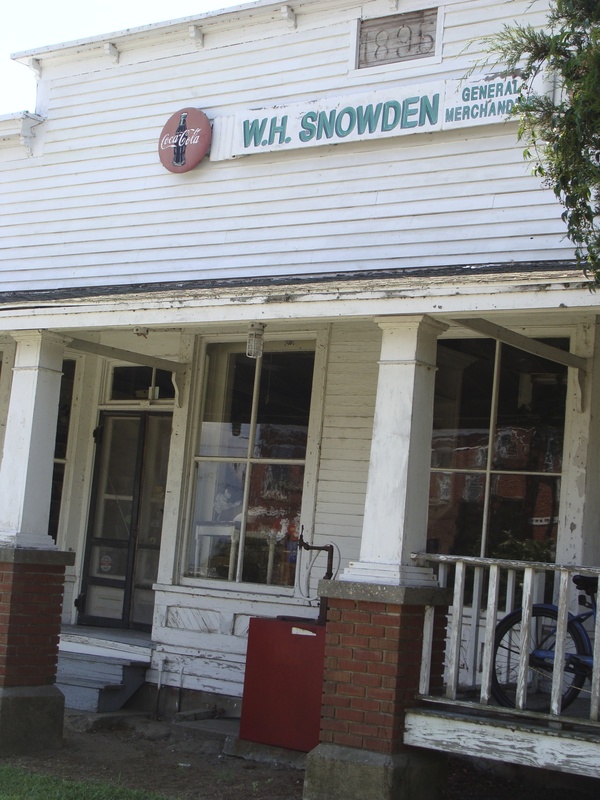 W. H. Snowden’s General Merchandising Store was closed but I could peek in the windows and see that it still retains the look of a country store. One of our favorite stops along Route 168 is the Peck Basket. Years ago the little store was not more than a shack but always had an eclectic array of items to gaze at or to buy. In its new site, has taken on the ambiance of a general store, replete with pot belly stove and old-time counters and open shelves. Built in 1966 and over a mile long, this bridge connects the Outer Banks to the mainland. Getting over the bridge on a Saturday is an exercise in patience as traffic backs up along 168 all the way to the Cotton Gin. The backup continues along Route 12, the only highway to the upper end of the island. Beach and bay scenes in Duck. Fanciful and elaborate gardens were kept to entertain Queen Elizabeth I during her reign. Our garden was created for your enjoyment, and as a living memorial to the time when Sir Walter Raleigh’s lost colonists lived in this very place over 400 years ago. Inside our brick-walled gate you’ll find a wonderful collection of Renaissance statues, a sound-front Elizabethan-gazebo, a sunken Elizabethan knot garden – all adorned by an ever-changing palette of year-round color from hydrangeas to native plants, perennials and camellias on ten sound-side acres. One evening we attended The Lost Colony, the longest-running outdoor theater. I especially enjoyed the 16th century choir music and the Native American dancers, who flung the sand in arches over their heads. Special effects, fire torches and guns blasting, added unexpected excitement and action. The story, an historical drama rather than a recreation of actual events, piqued my interest and I followed up with some research on my own. Our family members were friends with the “Queen,” played by Diana Cameron McQueen, so we stayed after the performance to meet and talk with the cast members.